Things to be added, as in a supplement or an appendix: The author included three addenda of new materials in his book. Something that has been added in a written document: The report has an addendum clarifying certain procedural actions. A list of things to be done at a meeting; schedule, program: What is on your agenda today? 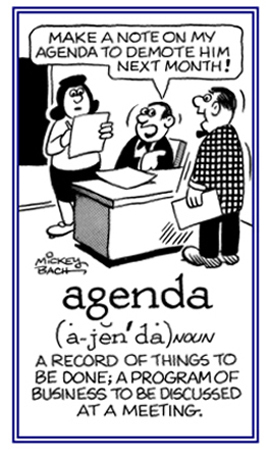 Agenda was originally the plural of Latin "agendum" (thing to be done) and is still considered by some to be a plural form. 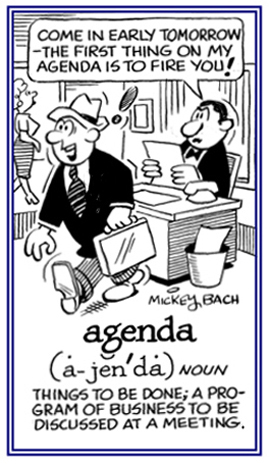 In modern English; however, agenda is usually considered as the singular form with agendas the plural: What is on the agenda for the meeting? The secretary kept track of the two executives’ agendas. After his secretary printed the new agenda, Gordan realized he also needed the revised addenda which should be printed in an addendum.